For Day 14, I did a vintage rose design. I actually did this design a long time ago when I first started my Instagram account. I decided to try it out again for the flowers prompt. I first painted my nails two coats of Color Club's Take Me to Your Chateau. 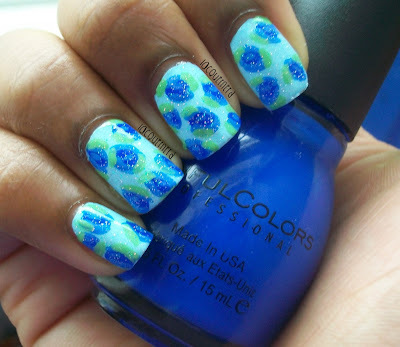 With a dotting tool, I created circles on the nails (they don't have to be perfect) with Sinful Colors Endless Blue. Next, I mixed Endless Blue with Wet n Wild's French Creme to create a lighter blue to make the rose shape. Finally, I made the leaves with Sinful Colors Pistache and finished off with China Glaze's Fairy Dust for some sparkle. I didn't quite like how these came out. I think I should have mixed more white into Endless Blue to make it lighter, since you can faintly see the outline for the roses. This is my second time doing the design, but I think it came out okay. What do you think of this design? Next up is delicate print! 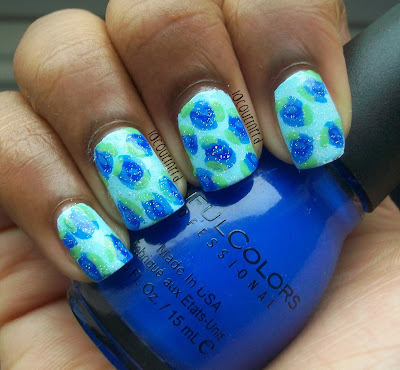 OMG, I love all the colors in this mani! The design is great, too. Good job!